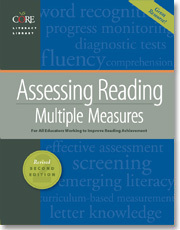 The revised 2nd edition of Assessing Reading: Multiple Measures contains the same assessments as the 2nd edition. Administration instructions have been clarified, and the general presentation of the content, including the assessments, has been improved. If you haven’t yet gotten a copy of this popular resource, this is the time to do it! The 2008 revised 2nd edition provides a collection of tests for the comprehensive assessment of skills related to reading. These assessments can help you, as a teacher, identify why a student is having reading difficulty and determine what the next step in instruction should be to remediate that difficulty. The assessments are intended to assist the teacher in determining the instructional needs of all students and in monitoring progress throughout the course of instruction. The Consortium On Reading Excellence (CORE) works collaboratively with schools and districts to implement comprehensive, research-based literacy training programs. Call 1-888-249-6155 for information about CORE training. 8 1/2x11, softcover, 208 pp.